This article is the first in our new series on storage ideas, designed to provide helpful tips and information for storing items that otherwise create clutter or a sense of being unorganized. Whether you want to keep and protect Christmas decorations, tropical plants and spring bulbs, seasonal clothing, or the children’s inflatable outdoor wading pool, proper storage ensures that stored items remain in the best possible condition for later use. The chosen location for any stored item needs to be out of the way of traffic, yet easily accessible. These “do’s and don’ts” make decisions about storage easier. Decide what items you want to store before buying storage boxes or containers. Document the measurements of any item that is over-sized, awkward or bulky. Measure shelving to determine container sizes that will fit. 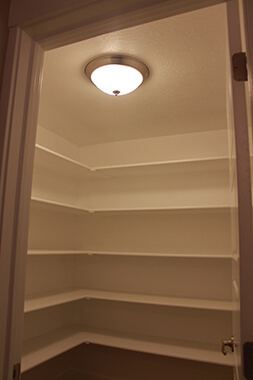 Consider atmospheric requirements of each item that you want to store. Room temperature, sunlight, air quality, and humidity vary; plan accordingly (for example, items made of rubber need to be stored away from direct sunlight). Determine the best location for storage. To provide temporary protection and storage for tropical plants that bloom and later need a period of rest, a dark nook in your basement might serve well. Protect fragile items from breaking. Provide them with individual wrapping/padding, or set them in containers that can absorb shock in case the container is accidentally dropped (for example, empty egg cartons make good containers for small Christmas decorations). Group stored items according to use, and label containers. This will make them more easily accessible. DON’T wad things up and shove them into boxes. The care you take now will be appreciated when you and your family members want to use those items again. DON’T stack heavy containers on top of each other. 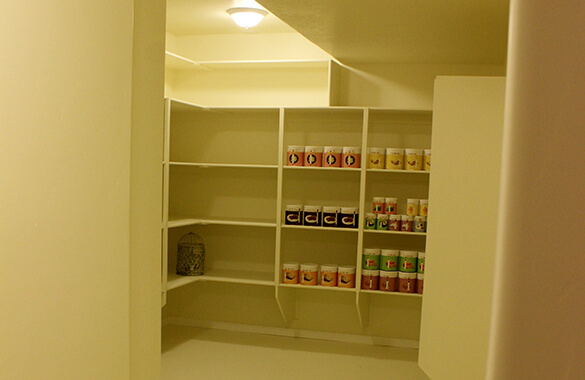 If necessary, add more shelves so each container rests directly upon a shelf. This also makes stored items much easier to access. DON’T stack stored items so high that the stack becomes unstable or the items are hard to reach. No sense in creating a safety hazard. DON’T block doors, windows, hallways, stairwells or fire escape routes. In your basement, make sure that access to each egress window well is clear at all times. DON’T store anything close to wiring, fuse boxes, electrical outlets, hot water heaters, stoves, furnaces, humidifiers or air conditioners. Keep access routes clear to all utilities, shut-off valves and switches. Reducing the clutter in your home by sorting items and storing those you want to keep is not work that can be completed in one day. Usually, an area that you are working on will temporarily appear worse rather than better. Stay with it! Once you finish sorting, organizing and storing, you will see a noticeable improvement. Perfection is not a necessary nor realistic goal. Your efforts will pay off. When you and your family provide efficient storage for items that are not currently in use, your home’s ambiance improves. Frustrations caused by disarray and clutter diminish, and everyone benefits. Small steps make a big difference!